Dante is a 17 year old black student in the UK, and he's waiting for the postman who's bringing Dante's A level results. University, a career as a journalist – a glittering future lies ahead. But when the doorbell rings it’s Dante's old girlfriend; and she’s carrying a baby. She tells Dante the baby is his... and then leaves! Suddenly Dante's future looks very different. 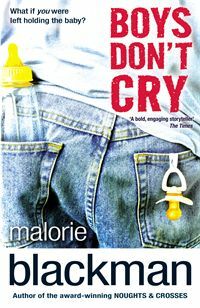 Add your review of "Boys Don't Cry" in comments! Hah with the name of the book and the title description being a male teen gets a baby surprise, I thought it was about a trans guy at first before I read the summary.